Leider ist der Eintrag nur auf English verfügbar. I discovered some great “traveller” suits and shirts – pure wool & cotton respectively – created with high-twist yarns. I travelled the USA for 5 weeks last year with them in my backpack. When I needed to be well dressed,hanging them out for a half day was enough to get rid of most of the creases – and because it was winter I often disguised them with a coat as well. It’s not that hard to be a well dressed backpacker – you just need to care what you look like, and do a little bit of smart planning! Yeah, the most importaint thing to do while backpacking is, to look good for the pictures and not look the same on each one. Especially while on a beach in the middle of summer, where you might need some swimsuit, so you need to pack it in. Backpacking and high heels don’t mix!!! Actually heels and backpacking can and do mix…..for me anyways! You just tie them outside your backpack and when you want to dress up viola you have shoes! Maybe because I have been travelling for 18 months now, but my heels make me feel feminine! Straight leg jeans, a great belt, v-neck t-shirts and button up white shirt kept me looking great through Europe. I rolled the legs of the jeans up when it got hot and – voila! – instant capris. The shirt I wore unbuttoned over the T as a light jacket, or knotted at the waist and buttoned up on its own. And a great belt – ’nuff said! For shoes I swapped between some great Reva sandals that have a solid grip sole on them, and some brown leather hiking boots. And yes, I did a brown leather hobo – fits everything, looks terrific. Thanks for leaving these great tips. It’s not easy staying fashionable while travelling but looks like you’ve got it in the bag! loved the article, great tips. too many people don’t give a hoot what they look like when travelling, which is ridiculous considering the amount of new people you meet along the way. I find that one of the most useful items to have with you is a big and beautifully coloured scarf! It. can be worn in a multitude of ways since you can wrap it around your body as a dress, a skirt or a top. Safety pins are the Key. Also you can use it as a shawl to turn your everyday dress into a chic evening Outfit or cover up in the cool as well as various religious places you might be visiting. It also works to protect your head from the sun, as a pillow or beachtowel or even tied together as a make-do bag if you suddenly find yourself in the need of transporting more than planned. It is a beautiful Way to incorporate some of the local fabrics into your wardrobe, even when you are back home. And last but not least you can wear it as a scarf! For me a neat utility travel wallet is a must have. It helps to keep papers organized and in place – Thank god for my Ilex London leather purse – such a saviour! 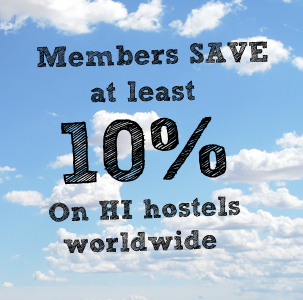 The HI blog is your resource for the real hostel experience. Find travel tips, advice from fellow travellers, and great news stories and articles from our blog authors. (English) Iceland’s Bardarbunga volcano threats: what do they mean for travellers? Don't miss out on great deals, discounts and travel tips. Create an account today and sign up for the monthly HI Newsletter.